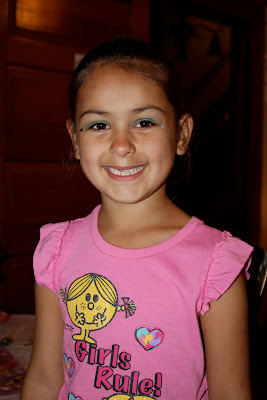 As soon as the girls arrived, they made their first stop at our "Beauty Station" They got their hair fixed, a little bit of eye shadow, super start stickers, perfume and a dose of GLITTER GIRL hair spray. Oh and I can't forget a little body glitter too. Gotta glitter these girls up. Hee! Hee! After being pampered they got to take their new comb and choose from a variety of fun things (hair clips, candy, rings, rubber bands, ect.) for their goody bags. The girls danced to some great tunes as they waited in line. They were so adorable. Then on to the nail station. These cuties don't have their hair and makeup yet. LOL Each girl was able to choose from a variety of polish and enjoy candies while getting their nails done. They loved it! I loved the set up. My fun friend Debadoo had this terrific idea to trace my daughters hands on paper doilies so the girls knew where to place their hands. After getting all pampered up with Hair, Make-up and nails polished the girls danced the night away. Well at least until it was present time. Cass was so excited and had so much fun with all her new presents. In the picture below, she was excited to get not only money but her very own visa card. WOW! Her best friend really wanted to read all the cards. It was adorable. They are always together. In fact we are headed to her party tomorrow. The Cake ~ a beautiful cupcake sunflower cake we found at Safeway. Mommy was sick and just couldn't do the cake. But loved this. It was a very fun party and the girls had a blast. I would definitely do this kind of party again and again. Just had to throw in the crazy pic too! Happy 7th Birthday to my Sweet Cassidy!!! Love Momma and Daddy! What a nice party! We've actually done very similar parties for our girls....love the girly stuff. LOL That cake is gorgeous! What a wonderfully,fun idea for a little ones party. I have a friend up the street, her little girl will be turning 9, and I just have to tell her about this great idea. I know all the girls would have fun. Thanks for sharing the party idea.. I've become a follower and found you via Follow Friday. Since you are hosting almost the same,I will take your button to add to me sidebar.. this is such a fun idea. What a great idea...LOVE it!!! I so don't think the Chazman would appreciated it...LOL...but I have some nieces that would adore it. Thank you for letting us share in such a wonderful event and for giving us some inspiration!!! That is a great party! i can not wait until my little girl is bigger so we can have a fun party like that too! Wow... looks like a great party!